Smok G-Priv 220W Review - A Well Rounded, Powerful Mod! Home → Mods → Box Mods → Smok G-Priv Mod Review – A Powerful Mod With Well Rounded Features! Smok G-Priv Mod Review – A Powerful Mod With Well Rounded Features! 2016 saw a new trend in the vaping scene with the inception of touch screen mods. Who doesn’t like a new trend, right? But with new trends, often there are some disappointments along the way, with some products which may look and sound fancy, just not cutting it in the real world. We have seen some good and some bad touch screen mods, however the path has been paved and Smok have come to the party with a new offering. Smok have been a busy company of late, putting out heaps of new products on the market. One of the most recent mods they have released is called is the G-PRIV, a dual battery 220w box mod featuring a 2.4-inch OLED touch screen display. The G-PRIV also features Temp Control with support for the popular non-resistance wires, TCR and a preheat option. This mod runs the same chip as the Smok Alien, however via a new method of control – the touch screen. I received the G-PRIV kit which teams this mod up with the TFV8 Big Baby Beast and it is most definitely a match made in heaven. Before we go too much further I would like to thank Heaven Gifts for supplying this kit for the purposes of this article. Check out the Smok G-Priv 220w Kit Here! 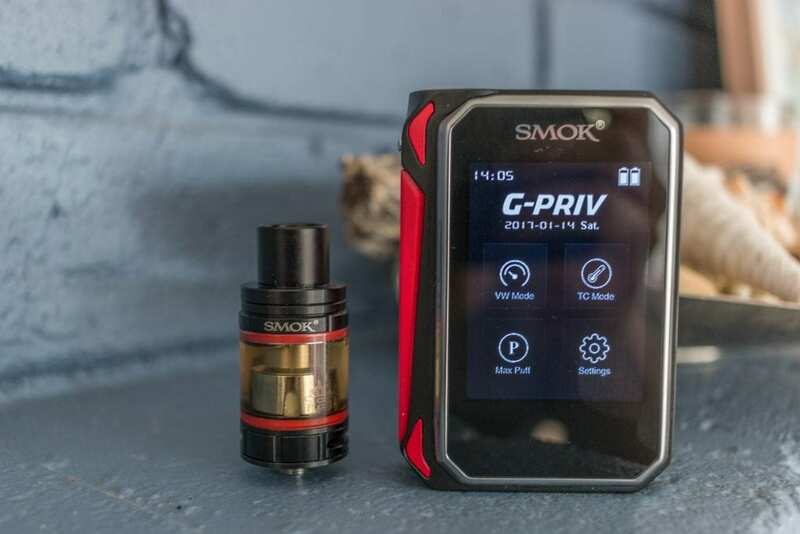 Click Here to Check Out the Smok G-Priv 22ow Kit! Use Coupon Code ACHEAP15 for 15% Off! As the Big Baby Beast has already been reviewed on Vaping Cheap, we will predominantly be focusing at the mod itself. Let’s jump in and take a look at this epic piece of kit. The packaging on the GPRIV kit is very neat and appealing. Not cheap looking or over the top, by any means, just right. The first thing that is revealed when opening the box is the mod itself, sitting well protected in the middle of its housing. This package is very well secured for transit, so there is definitely no worries with it getting damaged on the way. The tank and accessories are safely tucked away underneath the surroundings that secure the mod in place. The first thing that struck me, when the mod was revealed, was how big the screen was. Taking up pretty much the whole face of one side of the mod, this thing is huge. On the other side we are presented with a lovely looking carbon fiber finish that makes up the battery door. The fire button is red, which makes it stand out, accompanied by the other red highlights on the body of the mod. An absolutely stunning looking mod so far, I was getting excited to see how this thing would perform. Picking up the mod it feels very solid and robust, a very satisfying experience. The zinc alloy construction feels good in the hand, and you can feel the weight of the touch screen. The fire button is made from plastic and is a replica of the fire button found on the H-PRIV. It takes up most of one side of the mod and is designed to use by squeezing your fist around the fire button. The only other button on the mod is above the fire button. This is a silver lock button and looks inconspicuous, designed to be used without altering your grip on the mod and fire button. The carbon fiber battery door looks stunning and the magnets that hold it together are quite strong and adequate. The battery door, while held on snug, is straight forward to remove and insert the dual batteries. 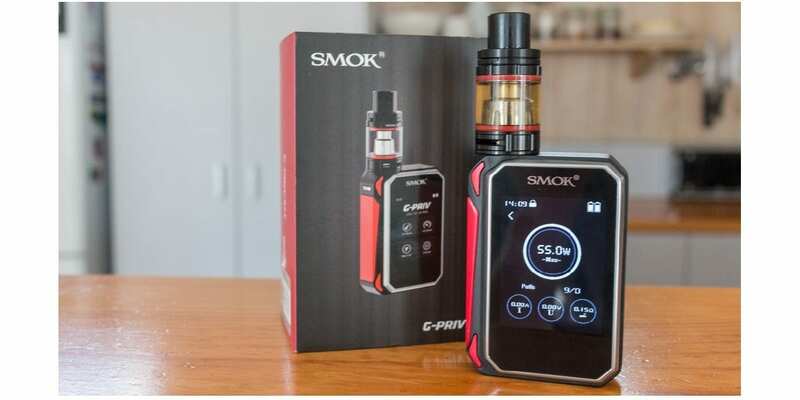 There is a USB port located on the bottom of the device, which can be used for charging the batteries or upgrading firmware from the Smok website. The spring loaded 510 connection looks to be of high quality and does not feature a catch cup to speak of. Smok have included a silicon protector for the mod, which is a nice touch in my view. It is easy to install and seems to provide adequate protection. The dimensions of the G-PRIV come in at 85mm tall by 58.5mm wide, and a depth of 28 mm. Coming in at roughly the same height as an RX200, all in all this is a fairly small mod for what it can deliver. Now to the screen, as mentioned previously, it is huge. It ships with a screen protector installed, however this easily falls off within a few moments of handling the mod and is only really good for transit. The shatter-proof 2.4 inch screen is truly the most exciting feature of this offering. Almost the same size as a small smart phone screen, this thing will definitely attract finger prints. The glass is flush with the mod and looks to be of high quality. If you are prone to dropping your mod, then hopefully the shatter-proof feature holds up well – I’m not game to try it myself. The colors available for the G-PRIV kits are Silver (with black trim), Black (with red trim), Gold (with black trim). The tanks are also colored to match the mod and all look like they were all meant for each other. 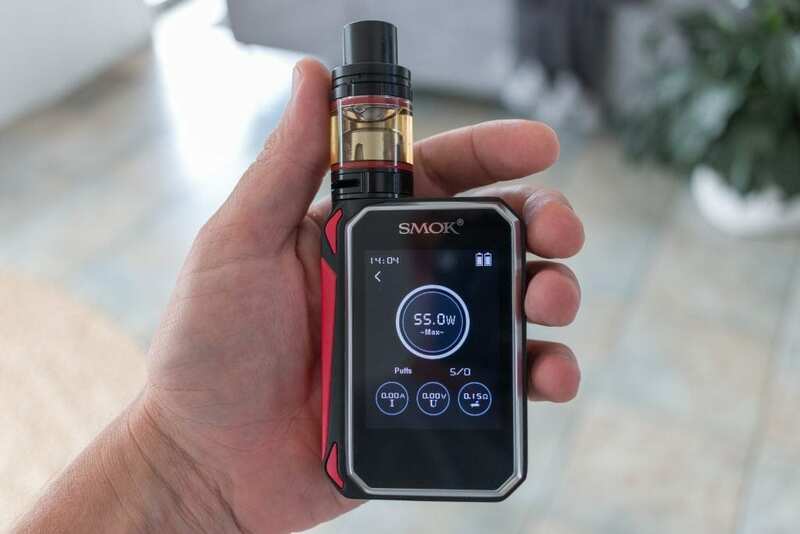 I have just seen on the Smok website there is now purple and red option. The Big Baby Beast did not come with an RBA section, which I believe to be a con. I have however seen that some of the newer G-PRIV kits are now shipping with the RBA section, so this is something to look out for if you are wanting to get into rebuilding this atty. Installing the batteries was a dream, there is a ribbon included in the battery tray to fold underneath which assists when removing the cells. The carbon fiber battery door holds on nice and tight to the mod via a strong set of magnets. There is no rattle on this mod from either the batteries, door or the buttons. Five clicks of the fire button will turn it on and the Smok logo splashes onto the display to let you know it’s alive. First up the mod will ask you to choose New Coil or Same Coil, a simple press on either button will make the selection. The home screen will display four icons TC Mode, VW Mode, Max Puff and Settings. When you enter the VW mode you can adjust the wattage from 1W all the way up to the maximum of 220W. You can do this via a slider bar for fast adjustment or by hitting the + – icons for a finer control. You can choose your quasi preheat settings by choosing one of the five effects. These are Min, Max, Soft, Normal, Hard. Once you have made your selections, press the activate icon to start vaping. You will now see your main screen that displays the wattage, battery indicators, puff count, resistance and the time. You can also adjust your wattage on this screen by pressing either side of the circle. The puff counter resets each time you power the mod on. When you select the TC mode icon, you will be presented with the 4 menu options. Firstly you can select your wire material from either Nickel, Stainless or Titanium. You can then set a preheat wattage from 10 watts up to 220 watts. You have the ability to adjust the TCR for the desired wire. And finally you can lock your resistance in to benefit from the true experience of temperature control. Press activate and you are ready to vape in TC mode. The only difference with the main screen is that instead of wattage adjustment, you are adjusting the degrees. The Max Puff icon tells you how many puffs have currently been taken since power on. You can set the maximum puffs, where the device will not let you go over this amount. I’m not really sure what the mentality behind this feature is, however it may work for some. And you also have the ability to reset the puff counter if you desire. The Settings icon will show you the ID or serial number of the device and the current firmware that is installed. You can adjust the screen timeout delay from 10 second to 240 seconds. You can adjust the time and the date or choose to reset the mod to its factory state. If you hold down the lock button, a padlock will appear on the top of the screen disabling you from changing any settings. If you press the lock button once, it will turn off the screen but still allow you to vape freely. If you press the fire button three times, it will lock the fire button until you press it another three times. I found the touch screen system very easy and smooth to use. There is no lagging or glitching to note and it is very responsive to your finger presses. This is quite impressive from a vaping mod, almost the same experience as using a modern touch screen smart phone. Who would have thought? Firmware upgrades are available from the Smok website, however they will only work if you have a PC. There is no support available, yet, for MAC users. Definitely another con for me here, but that again is subjective. This mod definitely passes the pocket test. Although its wide, it’s not too deep making it comfortable to slide into your pocket. It isn’t too weighty either, which helps in making this device pocketable. When you do put this mod in your pocket, remember to turn it off or lock the fire button. You will also want to lock the screen to make sure your settings aren’t changed by accident either. I find it is just easier to turn the mod off completely before putting it away, although when you do want to vape again, you have to wait for it to load up. I have to say the performance of this mod holds true to most of the mods on the market today in the same price bracket. The power delivered from wattage mode is spot on and quick, this can also be customized using the effects presets to reach optimum performance. Temperature Control mode is also very accurate, I tested it with all of the different wires that are supported and I found the standard TCR values that are already set work really well. Up against an RX200S in TC mode, I felt that G-PRIV was a little more accurate and satisfying. Smok mods usually do perform well in the TC department and this mod is no let down. I didn’t get any mis-reading of my atomizers or ohm jumping by any means. The mod performed solidly and I have yet to find any glitches or features that are not working as they should. Sure, there are going to be times when you forget to lock the mod or the screen and you adjust your wattage or temperature by mistake. But once you get used to it and how it works, you will start to do these things by second nature. You will automatically lock the mod once you reach your desired settings or lock the fire button or turn it off before putting it in your pocket. It’s a really easy mod to work with and incorporate into your vaping lifestyle. You’ll also get looks and comments from everyone when they get a glimpse of that wonderful touch screen! I found that the batteries continue to hold true output right up until the red low battery indicators have been shown for some time. Unlike some mods that drop off in power when the batteries get low, this mod does not and keeps performing right up to the end. Vaping at an average of 55 watts on the Big Baby Beast, I easily get two solid days of vaping out of a set of batteries before having to charge them again. Vaping at lower or higher wattage, or in TC mode will have varying results. Your batteries mAh level will also play a big part in how long your batteries last. The handy thing about the G-PRIV is that if you run out of batteries when you are away from the house, you can plug it in to charge on the go and top up your cells. As for high output regulated mods, this mod also needs to have batteries that are rated at over 20A of continuous discharge. It is also recommended to use “married” batteries of the same age and brand. Remember to always keep battery safety in mind when using any type of mod for vaping, if you need a refresher on battery safety you can read our article on that here. The fire button feels really nice to use and it has just the right amount of click to it. I have to say I like the oversized fire button as you don’t have to be so precise in using the same finger on a smaller fire button each time. It’s just big, ergonomic and hard to miss. You can use different fingers or all of them if you prefer. As I mentioned before this mod is very comfortable to hold and use. It does not get fatiguing to hold and it’s not too weighty in your hand or your pocket. It fits in your hand nicely and is really just a pleasure to vape on. All of the atomizers I screwed into the spring loaded 510 connector sat flush on the G-PRIV, including the Big Baby Beast. None of them sat up or created a gap, which I know is a sticking point for a lot of vapers out there. I did find the connector to be a little stiff and hard to screw down fully at the start, but it eased up and became much more fluid with some use. Attys up to 25mm all look good on this device, anything over this size protrudes over the edge and doesn’t look quite right. The USB port can be used to both recharge the batteries and for firmware upgrades. There are firmware upgrades available from the SMOK website, however they are only compatible with PC not MAC at this stage. In conclusion, the Smok G-PRIV is a very well made piece of kit and holds true to the performance and reputation of Smok mods. This mod will provide you with an excellent vaping experience, to which you will not be disappointed with. The G-PRIV feels great, looks great and best of all it vapes great too. It has excellent TC performance and has the ability to customized as well. An added bonus is that if you forget your watch or phone, you can check the time and date on this mod with ease! If your looking for a dual battery mod or kit, I have no hesitation recommending the Smok G-PRIV for the price point. 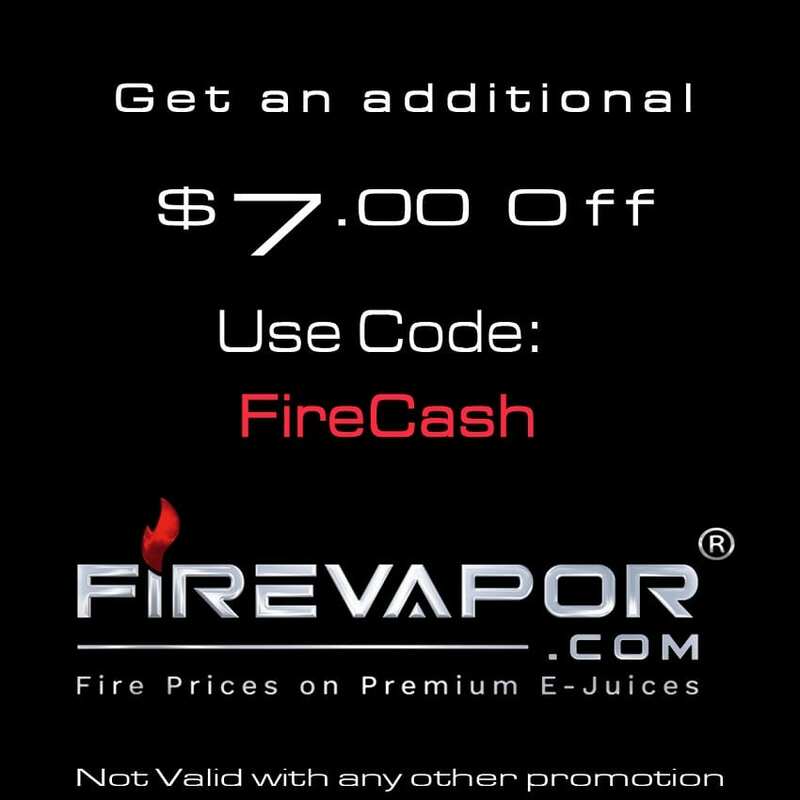 I hope you find this review helpful in finding the right device to fit all of your vaping needs! Feel free to leave any questions or comments down below and thanks for reading!